Struggling to curb your sweet tooth? Here are a few simple solutions to help limit your sugar intake. The average American consumes more than 100 pounds of sugar a year – bad news for your teeth, waistline and overall health! The good news is that you can still enjoy some sugary indulgences by making smarter choices. It’s all about limiting – not eliminating – added sugars. It doesn’t matter if a food that contains sugar looks or sounds healthier – it’s all the same to our body. Don’t be fooled by honey, brown sugar, turbinado sugar, raw sugar, agave or molasses added to packaged foods. They are not healthier or more “natural” and still have the same 15 calories per teaspoon as plain white sugar. KNOW YOUR NUMBERS: HOW MUCH SUGAR IS IN A SERVING? Check the package label for the term “total sugars “ or “added sugars” per serving and divide the number of grams by 4. That’s how many teaspoons are in that serving. While grams add up quickly, most people don’t connect with that term, so figure out the teaspoons for a more realistic view. The newest recommendations from the American Heart Association suggest that women limit daily intake of added sugars to 6 teaspoons (24 grams) or less. Men should aim for 9 teaspoons (36 grams) or less. Always eat your fruit – don’t drink it. Skip the sodas, juices and coffeehouse drinks. And don’t be fooled by buzzwords like “green tea” and “strawberry” in the name. Many of these drinks are sugar bombs, with 20 teaspoons of sugar or more. If you love juice, try a splash in a glass of water or seltzer. If you want the “real thing,” downsize your serving to a small (still usually a hefty 12 ounces!) of your favorite juice, smoothie or coffeehouse drink. 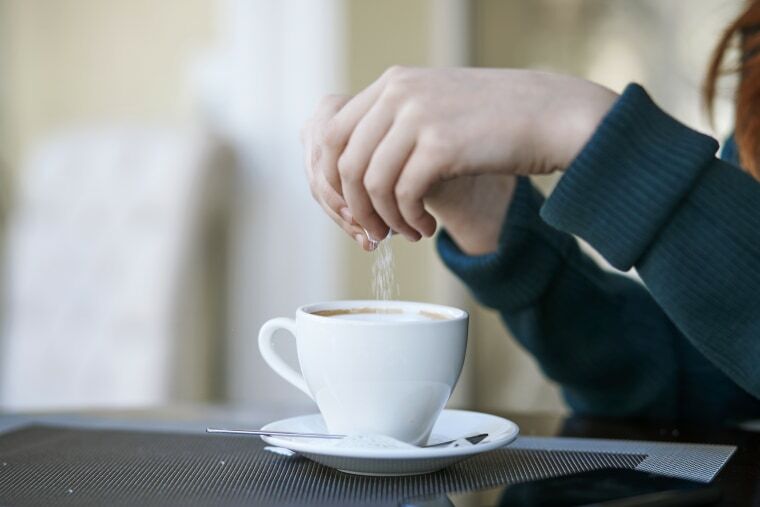 Pay attention to the sugars you sprinkle on foods and drinks throughout the day in your coffee, tea or cereals – they add up fast. Try a low calorie sweetener, cut your usual amounts by half or more, or go without and let your taste buds adjust over time. Beware of fat-free products when it comes to added sugars. When fat is removed, sugar is often added to maintain taste. Watch out for prepared foods that might not taste too sweet, but are often load with hidden sugars – like reduced-fat muffins and granolas. Ketchup, barbecue sauce and teriyaki sauce are all surprising sources of added sugar. Just a “squirt” of ketchup (about a tablespoon) has one teaspoon of sugar! The same goes for jarred pasta sauces, another hidden sugar culprit. Read those labels carefully and choose a low-sugar version (or make your own).